Your one stop shop for all your Simple Simon's Promotional Tools. SimpleMailings.com prints and processes all of its direct mail in-house. Because we service clients nationwide we are able to process multiple jobs together to combine economies of scale in printing and processing. This results in significant cost savings in printing, postage and shipping. Many of our jobs use a "Group Buy" model that allows us to create large quantities of generic designs and then customize them for individual dealers. Custom cards and single campaigns are also options for dealers. Our standard postcards are designed to stand out from other mail using a heavy 10pt Card Stock. Our sizes include but are not limited to: 4"x6", 6.125"x9.5", 6.25"x9.5" (Every Door Direct Mail), 6.125"x11", 11"x17" trifold, 6.125"x18 bi-fold. These size options optimize the ability to cost effectively produce a high quality direct mail design, while keeping costs low based upon the combined value. If you need printing we are your printing source. With our in-house print and mail shop we can help you no matter what the size of job. Let us help you the next time you need printing services. We are your promotional product distributor. Promotional products, also known as ad specialties, make up a nearly $17 billion dollar industry and are used by virtually every business in America. Why? Items like mugs, pens and t-shirts are memorable and provide a better cost per impression for advertisers than almost every major marketing effort like TV, magazines and the Internet. We are able to supply your company with every possible promotional product from over 3000 suppliers. With so many ad specialties available there is a huge opportunity for professionals like you to boost ROI and leave a lasting impression with your customers. Our mission is to help you create long-lasting relationships with your clients through the power of promotional products. Direct Mail Group Buy minimum order requirement for a retailer is 1,000 pieces per drop. Orders must be submitted before the deadline date. If orders are received after this date the retailer will be contacted by a Simple Mailings Representative and they will be moved to the next in home date. 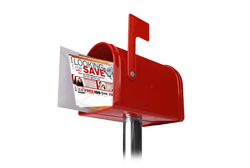 Direct Mail campaigns: Simple Mailings will run a demographic analysis on the zips supplied by the retailer. The analysis will be returned and must be approved by the retailer no later than the Wednesday following the order deadline. If a retailer has not communicated their mailing preference on the demographics, Simple Mailings will not mail the campaign until the demographics are approved. Carrier route selection is on a first come first serve basis. Direct Mail and FSI Campaigns: Customizations must be proofed by the retailer before they are sent. Simple Mailings is not responsible for misspelled retailer information if that is the way it was submitted. Simple Mailings is not responsible for final proofing of customizations submitted. Retailers that submit/participate with tag lines that do not follow Exede co-op guidelines assume full responsibility of the campaign if the co-op claim is denied. If you are unsure of what can be used consult the latest version of the respective companies Co-op Guidelines. Changes to customizations MUST be made before the order deadline date. Direct Mail: In-home dates are subject to change and are dependent on the post office. Campaigns may hit early or later depending on how each individual post office processes the mail. In home dates are submitted as a request to the post office but not guaranteed. Post office delay may cause mail to be in homes later than requested. Simple Mailings does not guarantee the results of a direct mail campaign. FSI Campaigns: Simple Mailings does not guarantee the results of a FSI campaign. Payment Details: Simple Mailings will collect the amount in full for the jobs. Co-op payments will be reimbursed by the respective co-op programs in accordance with their guidelines. By placing this order you confirm that you are in agreement with these rules. Thank You for choosing Simple Mailings. In addition, Simple Mailings will not send you e-mail that you have not agreed to receive. We may periodically send you e-mail announcing news and event information. If you choose to supply your postal address in an online form, you may receive mailings from us as well. Simple Mailings never sells, rents, leases or exchanges your personal information with other organizations. Simple Mailings assures you that the identity of all who contact us through this Web site will be kept confidential. Simple Mailings may occasionally send mailings on behalf of other organizations or ministries when their interests align with Simple Mailings. Simple Mailings is committed to ensuring the security of your personal information. To prevent unauthorized access, maintain data accuracy, and ensure the proper use of information, we have established and implemented appropriate physical, electronic and managerial procedures to safeguard and secure the information we collect online. Simple Mailings uses Internet Encryption Software, Secure Socket Layer (SSL) Protocol when collecting or transferring sensitive data such as credit card information. Any information you enter is encrypted at your browser, sent over the public Internet in encrypted form, and then decrypted at our server. Once we receive your credit card information, it is accessible only to a small number of trusted Simple Mailings employees who have been specially trained in processing this information.